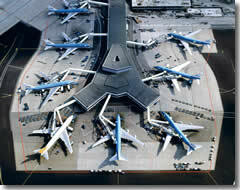 Amsterdam's ultra-modern Schiphol Airport is just 20km (12 miles) outside the city center (tel. in the Netherlands: 0900-0141; tel. outside the Netherlands: +31-(0)20-794-0800; www.schiphol.nl). How do I get betwen Schiphol Airport and downtown Amsterdam? The cheapest way to and from the airport is by train. Regular trains—around eight per hour—run between the airport and Amsterdam's Centraal train station in 17–20 minutes for €3.70 ($5.30). Be sure to book a second class ticket, as it doesn't really matter and first class costs €6.30. A taxi to or from the airport costs a whopping €42 ($61).